This is not an April Fools’ Day joke. --Microsoft just officially announced that they will discontinue all Encarta products by the end of the year. They will shutdown all of their Encarta websites worldwide and will stop selling their software, namely Microsoft Student and Encarta Premium encyclopedias. Encarta has been a popular product around the world for many years. However, the category of traditional encyclopedias and reference material has changed. People today seek and consume information in considerably different ways than in years past. As part of Microsoft’s goal to deliver the most effective and engaging resources for today’s consumer, it has made the decision to exit the Encarta business. To be honest, I really find Encarta a valuable and rather entertaining tool for learning at the time when there was no Internet. Back then, I find it amusing that a single CD ROM can replace several volumes of encyclopedia. As they say, all good things come to end. Wikipedia, with more than 2 million entries (in English) compared to 42,000 for Encarta, is certainly the best thing that ever happened to encyclopedia. The website is loaded with updated and comprehensive user-generated content. Best of all, it is free. By the way, you can also read Wikipedia articles offline as I explained before. Now that Wikipedia is all alone at the top, I just hope that it will focus more on maintaining the quality rather than the quantity of its content. 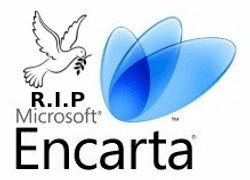 If you have something to say regarding Encarta’s death, please share your views to us via comment. The Encarta page was so obviously biased towards one point of view that I had to laugh. I could never trust Encarta again. An encyclopedia should have facts, not polemics. Wikipedia has its shortcomings, but it beat Encarta fair and square. I'am not a big fan of Encarta but to be honest wikipedia can't be reconized as an encyclopedia. It contains many errors and subjectives informations. For my personnal experience (science) there is a lot of bad/wrong/incomplete informations. For me at this time, nothing can replace real encyclopedia with validators and expert. What I loved was Encarta Atlas 2000. I spent a lot of time with this piece of software. Do you know about newer version? I didn't find any notice about it..